The grain marketing team at Sunrise Cooperative makes your bushels our business. With 14 grain storage locations that hold just under 45 million bushels of grain collectively, Sunrise grain has the capacity, partnerships, foresight, and industry experience to help manage your risk and maximize your return on investment in a potentially volatile market. From personalized marketing plans to structured grain contracts, our Grain Solutions Advisors have your operation’s best interest at heart. Craig Haugaard gives daily details on the state of the grain and livestock markets. Managing your risk to maximize your return can be overwhelming, regardless if you’re an experienced grain marketer or new to grain contracts. That’s why Sunrise offers a variety of customizable grain contracts to look at each farm individually and create a plan that works for your specific operation. 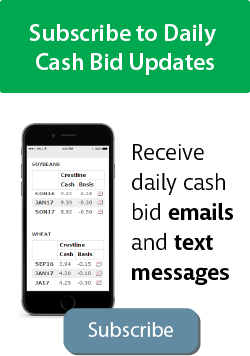 View our Grain Contract offerings to find what best suits your needs. Not sure what the best option is for your operation? Connect with a Sunrise Grain Solutions Advisor today. Grain marketing can be complex and challenging. That’s why SunSolutions® offers a complete portfolio of solutions to help you manage your risk through pricing diversification. Our team of solution advisors work with you every step of the way to help you choose the tools that best complement your grain marketing plan, cover your market exposure and help you realize your overall pricing strategy. Our Integrated Risk Management program utilizes a unique risk management tool that utilizes both the agronomy and grain marketing teams working together in a completely transparent approach to explore profit/loss and hedge positions allowing the producer to make the best decisions for their operation. Sunrise has several Grain Programs available to producers to help you manage your risk.